Try to overlook Bill Bruford’s past experiments with electronic drums. Forget King Crimson. And while you’re at it, try to get over your nationalistic bias against the whole Brit-jazz scene (of which Bruford has come to be regarded as its Art Blakey). The fact is, if Bruford hasn’t already established himself as one of the premier working drummer-composers in jazz-right up there with the likes of Peter Erskine, Bill Stewart, Matt Wilson, Jeff “Tain” Watts and Ralph Peterson-he certainly does with Footloose and Fancy Free, a live 2-CD set recorded at London’s PizzaExpress Jazz Club in the summer of 2001. Though Bruford did carve out a historic niche for himself during the ’70s with the art-rock groups Yes and King Crimson, since 1986 (with one sidetrack for a whirlwind Crimson reunion tour in the mid-’90s) he has concentrated on his first drumming passion-jazz. 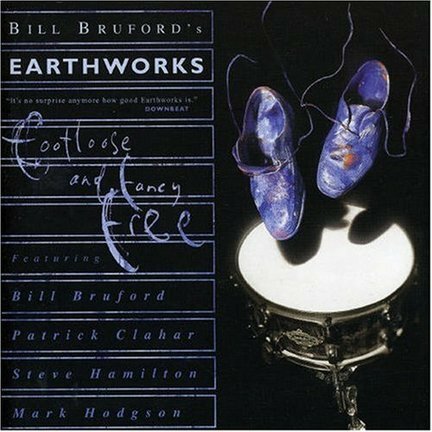 Bruford’s band Earthworks has turned out consistently strong recordings that showcase the leader’s supple swing chops and polyrhythmic aplomb along with his thoughtful, multidirectional compositions that studiously avoid the age-old head-solo-solo-solo-head format of mainstream jazz. Along the way Bruford has also demonstrated a knack, a la Blakey, for recruiting bright new talent (the gifted saxophonist Iain Ballamy and the immensely talented Django Bates were in the first edition of Earthworks). The star of this latest edition of Earthworks is saxophonist Patrick Clahar, whose pungent tone, wailing chops and tendency toward precision suggest a younger Michael Brecker. Indeed, the band that Bruford’s current Earthworks most resembles is the recent Brecker Quartet, with Bruford playing Tain to Steve Hamilton’s Joey Calderazzo and Mark Hodgson’s James Genus. On this ninth Earthworks offering, Bruford quickly establishes the band’s drive and flexibility through the sudden transitions and time signature shifts of the swinging title track that opens the first CD. On soprano sax, Clahar acquits himself nicely with a lyrical flair and golden tone on the melancholic ballad “A Part, and Yet Apart,” which he co-wrote with Bruford and Hamilton, and also on the sinister-sounding “Original Sin,” which incorporates some dazzling drum flourishes and hip time displacement from Bruford. But it is on tenor that Clahar really shines here, as he unleashes with Breckerish abandon on four impressive showcases in “Never the Same Way Once,” a surging “The Emperor’s New Clothes,” “No Truce With the Furies” and “If Summer Had Its Ghosts,” the title track of Bruford’s 1997 chamber trio collaboration with guitarist Ralph Towner and bassist Eddie Gomez. Pianist Hamilton, who is Bruford’s most frequent co-writer, shows a decided Jarrett influence throughout, particularly on “Cloud Cuckoo Land” and Bruford’s beautiful ballad “Dewey-Eyed, Then Dancing.” He shows a crystalline touch on the gentle ballad “Come to Dust,” which has Bruford switching nimbly from tasteful brush, mallet and stick work behind Hamilton and Clahar’s solos. And Hamilton’s cascading solo on “The Emperor’s New Clothes” reveals touches of Herbie Hancock and Chick Corea’s influences as well. Bruford, for his part, remains an original. As a player, his tight, high-pitched snare sound is instantly recognizable. As a composer, his tendency toward overintellectualizing the process is balanced by an inner urge to swing. Those two qualities working in tandem have allowed him to build an impressive body of work with his various Earthworks lineups over the past 16 years. Footloose and Fancy Free is a testament to Bruford’s enduring legacy as a first-rate jazz drummer, composer and bandleader.